Whether you have a single room that is too hot or too cold, a home that needs a new heating system, or anything in between, Halco has a solution that will work for you. Ductless systems are a type of air-source with heat pump technology that are sometimes referred to as mini-split systems or split ductless systems. These systems come with a compressor and condenser outside the home and a small air handler unit mounted on the wall or ceiling inside. The two parts are connected by a refrigerant line and work by transferring heat rather than converting it from fuel, like combustion heating systems do. According to the Department of Energy, when ductless systems are properly installed they can deliver up to three times more heat energy than the electrical energy it consumes. Halco works directly with Mitsubishi Electric Heating and Cooling to bring you top-of-the-line ductless solutions that work best for you and your home. Our wide range of products provides a cost-effective way to replace or upgrade those old, less-efficient HVAC systems in your home. Both homeowners and contractors can find a permanent HVAC solution in ductless heat pumps. Mini-split systems are well-suited for retrofit applications and require a non-invasive installation, with only a 3-inch hole through the wall needed to connect the indoor and outdoor units. Ductless heating and cooling units can be installed in home additions, new constructions, condominiums, apartments and more, providing precise comfort to specific rooms. Ductless heating provides precise comfort. For an example, click the image above to enlarge. Unlike traditional systems that treat the air in your home at a central location and then distribute it to each room, our systems treats the air right in the room where it's needed, meaning you get room-by-room temperature control and better energy efficiency. With single-zone solutions, when one indoor unit is connected to an outdoor unit, your home is provided with individual comfort control to a single defined space. 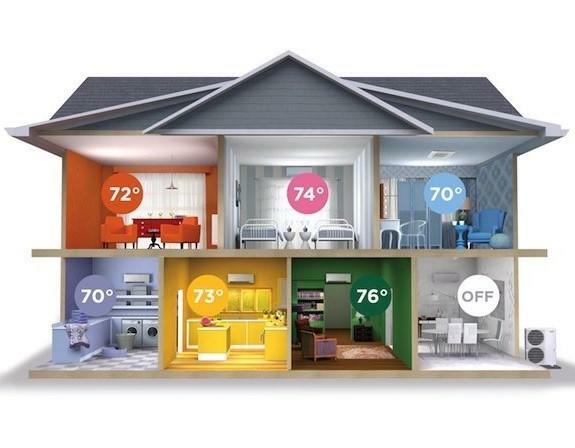 With multi-zone solutions, you can individually control up to eight zones from one outdoor unit. Personalized comfort has never been so easy! As a Mitsubishi Diamond Elite Contractor, you can count on Halco to give the highest level of professionalism and unsurpassed technical expertise. Diamond Contractors are highly trained and can provide you with extended warranties on Mitsubishi Electric Heating and Cooling Systems. If you're interested in installing a ductless system in your home, Halco can help. Our experts will evaluate your home and help you determine the best system for your needs. Contact us today to get an estimate on any of our ductless HVAC services in The Finger Lakes, [ state abbr] including Rochester, Ithaca, Syracuse, Auburn, Webster, Pittsford, Cortland, Canandaigua, Fairport and nearby!